Blogging can be a ridiculously time-consuming hobby. Most of us do it just because we love it and we don't have any real expectation of an income. It is nice, however, to make a few bucks here and there (to, say, cover the cost of your domain). I've tried out a couple different ad networks and Google AdSense was the pretty obvious choice after I tried them out side by side. Over a two month period, my income from my Google ad was triple what I earned from the other publisher. That's THREE chapsticks instead of one! Like I said, a few bucks here and there. Keep those expectations low, my friends. 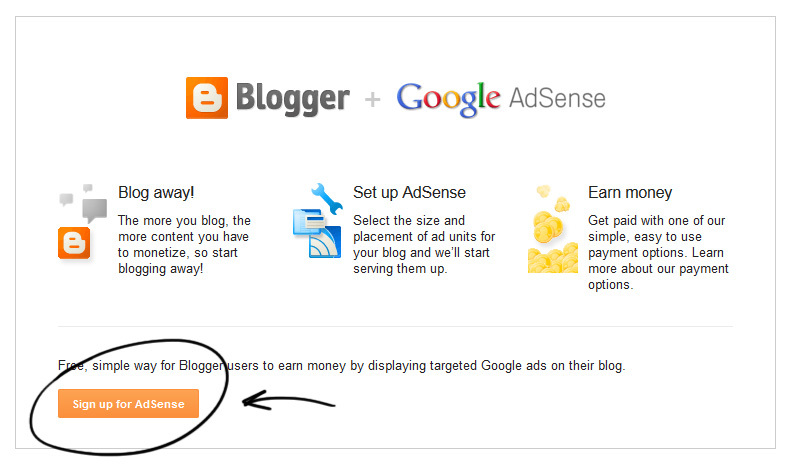 One of the nice things about AdSense is that it's super easy to install if Blogger is your platform of choice. 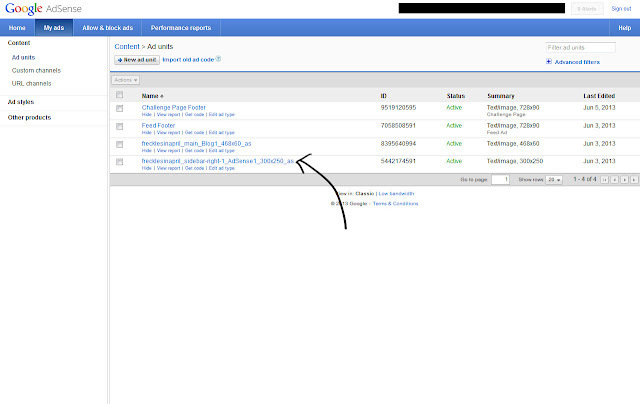 Click "Sign up for AdSense" to go through the Sign Up Wizard. Make sure the "Yes" button is selected for "Show ads on blog" then use the drop down menu to decide if you want ads in your sidebar, below your posts, or both. Then click "Save Settings" and you're all set up! Mostly. Click the "View dashboard" link (visible in the screenshot above under "Google AdSense"). A yellow alert will pop up at the top of your dashboard to walk you through the final steps that allow you to get paid. Google has to verify your bank account and address, so make sure you take the time to finish this stuff. Your dashboard is the gateway to all kinds of awesome functionality. 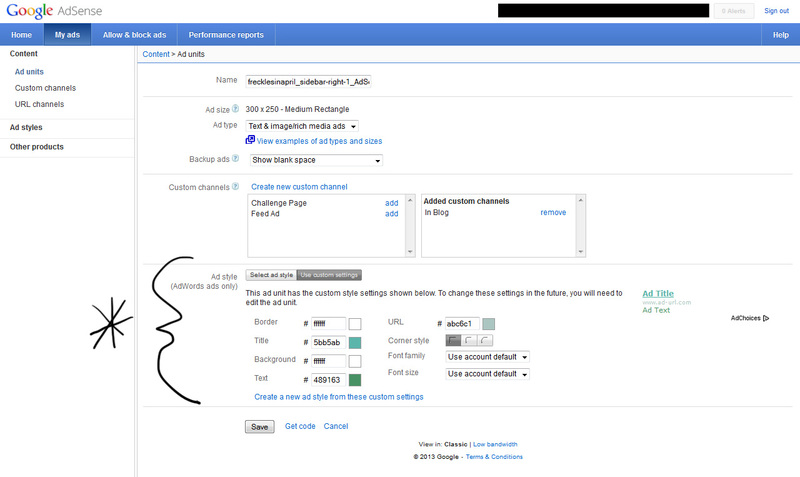 I'm just going to show you real quick how to change the look of your ads so they match your blog design. 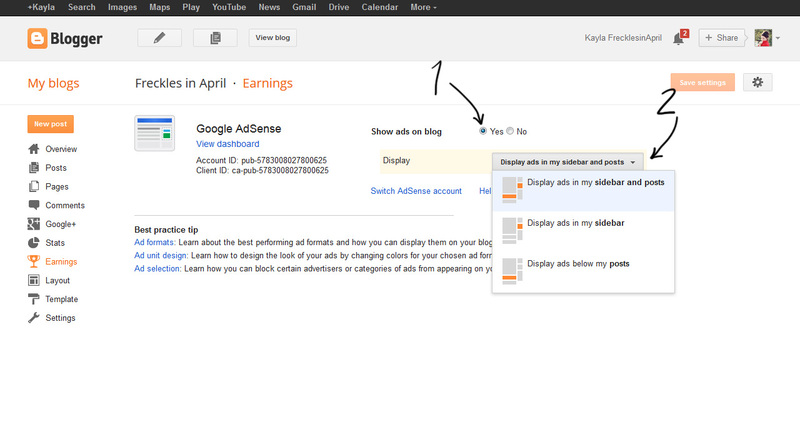 From your AdSense dashboard, click "My ads". This is where you can see your ads and create new ones. Click the title. 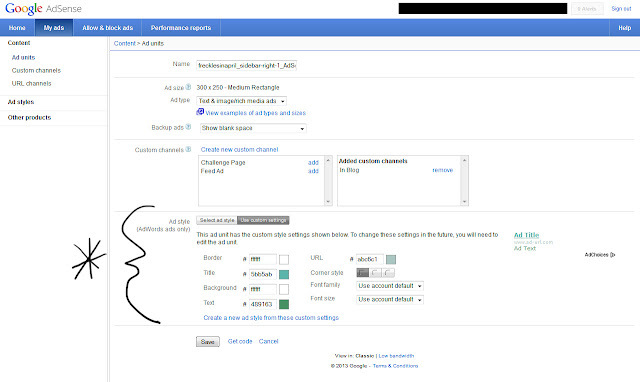 And here's where you can edit the appearance of your ad. I like to have mine match my blog's current color scheme. It makes the ads less visually jarring. After you edit your colors, click save. This, obviously, is barely scratching the surface of AdSense, but it will get you started. I love Google's native AdSense training, called AdSense Academy, for more in-depth information and tutorials on how to get the most of our your AdSense. You should, at the very least, take a look at the program policies as soon as you install so you can make sure you won't get kicked out for rookie mistakes (like clicking your own ad). AdSense Academy is also great if you're wanting greater control over your ads (like blocking ads you don't like) or want to run and analyze performance reports. 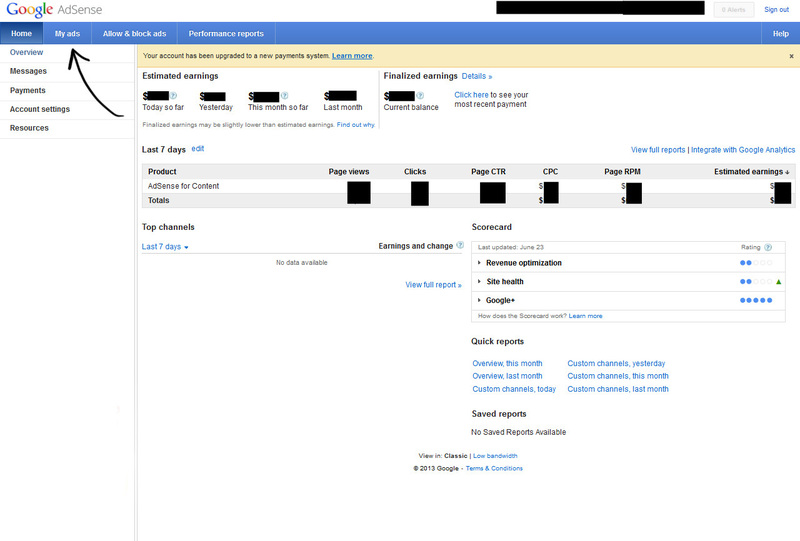 Also, note that AdSense pays out when your earnings balance reaches $100. Haha, glad I'm not the only one who is raking in all those pennies! ;) I like the GA is nice for just leaving there and getting a little cash for not doing anything at all. Also, the $100 min payout is sad, because at the rate I'm going, I don't think I'll get paid for awhile.